I only lately heard about CmapTools. If you are not use to read concept maps you may find the textual description of the software more user friendly. 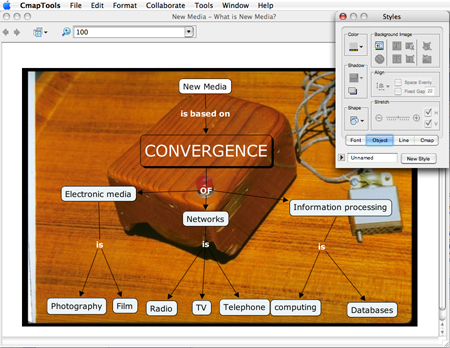 CmapTools is a software toolkit design to facilitate manipulation of concept maps. It’s pretty brilliant set of software tools, although with some extra features it could be a great group meaning-making tool, as well. Two weeks ago, Alberto Cañas from the CmapTools project visited Helsinki. The CmapTools project is a research project carried out in the Institute for Human and Machine Cognition. I didn’t make it to his lecture as I was traveling, but my colleagues went to see him and his demo. Now we have our own CmapTool server running and are very interested in to find out what we can do with it. It is a really nice piece of software. What I really like is that CmapTools is a real “concept map tool” – not a mind map, drawing tool or any kind of hybrid of these. It seems to be very good tool for the task it is designed for. Probably the nicest features in it are those making it possible to collaborate on the concept maps with other people over the network. If you have a server running you can let other people to modify and annotate your concept maps. This way CmapTool is a groupware, collaborative software or social software (whatever concept you like most), as well. The search features are really nice. For instance you can search other concept maps and web with your own concept map! It works so that it picks-up from your concept maps the search terms (your concepts) and makes the search with them. In five minutes I found some maps made by some people I have met in Colombia and who I didn’t even know that they are using the tool. I have some ideas that could make CmapTool even more useful in a collaborative use. At the moment (at least I couldn’t find any) there are not any “alert” features letting me automatically know if someone has edited my concept maps. RSS would be great for this. Possibility to link concept maps together could also help collaboration around them. Visualizations of the whole “concept map sphere” would be a natural way to browse them (at the moment you either use hierarchical folder structure or the search feature to find maps). The visualization of the whole “concept map sphere” could simply be implemented by adding concept maps with same concepts close to each other. And then the reasons why I decided to write about the tool to this blog. In CmapTool there are many great features and with some additions made in it, it could become CSCL and social-constructivist learning tool. So what is needed? The object, where you now write your concept, should be such that you could also write some content in them – more like notes with subject line, content, inline images and links to other files. This way the concept map could become spatial “discussion forum” where group of people could add notes related to other notes and makes links between them. Objects should also have “scaffolding feature”. Objects should carry category with help text and check lists orientating and supporting (scaffolding) participants to have scientific discourse in the space. Like in Fle3 Learning Environment. Each time when you would add a new object you would be asked to choose what kind of knowledge you are bringing to the discourse: problem, hypothesis, scientific theory etc. The scaffolding idea comes from Vygotsky’s development theory. the version I'm using (CmapTools 4.0 beta 7) has some similar feature: on Tools –> Add Info… You can add info that are readable passing over the mouse. Not suported are inline images, nor links to other files. But you can link to resources with shortcut icons and set a background image to every node. Hi Alfredo, Thank you for the hint – I also have the latest version, but only after your note I found the “Add info” feature. You are right it makes it possible to add some content to the concept, but it is not really what I have in mind. Also the implementation of having the info text in a mouse-over tooltip is very confusing. The tooltip should be used for tips about the tools, not for anything else!Also thank you for the link to your project. I hope you will write something in somewhere about your experiment and let us know how did it go. I wish you good luck!I understand if the developers want to keep the tool “a pure tool” for concept maps. But, I think combining concept map thinking with the ideas of knowledge building discourse could be very interesting. Today I came-up with this idea that actually the propositions (the link words) should contain the scaffolding feature. When you have a “study problem” in one object and start to write another object you should be asked to choose from a ready-made (pre-defined) set of proposition how is your new object related to the problem-object. The set should contain such propositions as: “is my theory/hypothesis of”, “is a scientific evidence of”, is “a critical evaluation of”, is an request of more information related to”, “is a raise above of”, “is a summary of”. This way the system would automatically guide users to do scientific inquiry. Huh. Our target is to write a paper on this starting experiences of international e-twinnings mediated by e-Conceptmaps mono and bilingual, and to present it at the 2nd Congress on Concept Mapping In Costa Rica. Hope to see you there and to read about you!